As the scenes change, we become aware that in this musical, each new set (designed by Scenic Designer STANLEY A. MEYER) bears resemblance to the printed illustrations on the books’ pages of children’s fairy tales, but that this time what looks like the illustrations are three-dimensional and life-size. In MEYER’s Sets, each object is carefully constructed, painted in bright colors, and aesthetically organized within the confines of a frame. From the outdoor sets of Belle’s village, to the outdoor set of the “Beast’s” (SAM HARTLEY) “woods” at night, displaying the silhouettes of the trees in the darkness and the prowling white wolves jumping around, to the intricate interiors of the Beast’s castle. Each set, is a piece of art. And because the quality of any production depends on its actors’ experience, This touring production is excellent, because of its cast. Each one of the actors playing a principal role, is a star with printed credits filling an inch long under his or her name on the program. They are:, SAM HARTLEY in the role of the Beast, BROOKE QUINTANA as Belle, THOMAS MOTHERSHED as Maurice, CHRISTIAAN SMITH-KOTLAREK as Gaston, and MAT DASILVA as LeFou. 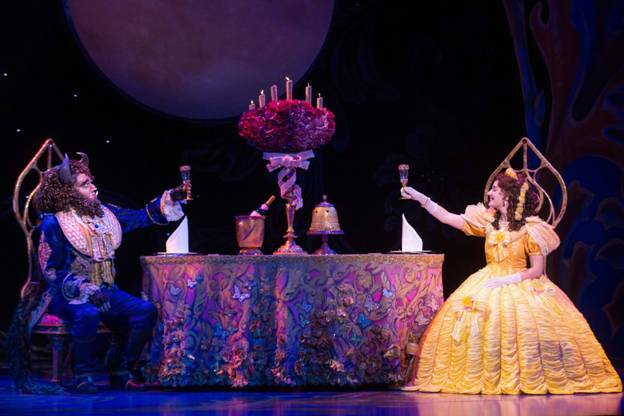 Inside the Beast’s castle, playing the roles of the “enchanted ones" are: RYAN N. PHILLIPS as Lumiere, MELISA JONES as Babette, STEPHANIE GREY as Mrs. Potts, STEPHANIE HARTER GILMORE as Madame de la Grand Bouche, SAMUEL SHURTLEFF as Cogsworth, with the role of Chip, the cup, realistically played by the child JAKE JONES on that night. All these actors sing well and have good voices. Enhancing the performance, are the costumes ( designed by ANN HOULD-WARD) the puppet design of BASIL TWIST, the Illusion Design of JIM SSTEINMEYER, the lighting Design of NATASHA KATZ, and the beautiful music written by ALAN MENKEN, with lyrics of TIM RICE and HOWARD ASHMAN. On that night the orchestra was directed by SHANE PARUS . Yet, what makes this show special, is its story, (The book for the musical and the film based on the story, was written by LINDA WOOLVERTON). The original BEAUTY AND THE BEAST is a French story called “La Belle et la Bete”, believed to have been written in l757, in French, by the French writer JEANNE-MARIE LePRINCE de BEAUMONT (l7ll-l780). Through the years, her story of a man who had six children: three girls and three boys, with Belle, as the youngest one, who to please Belle stole a rose from the Beast’ garden, have been changed, many times, and to date, only three of the original characters survived: Belle, her father, and the Beast. Belle’s shallow sisters and her three brothers were cut completely from the story and the character of and Gaston, added to make more clear the story’s contrasts. The musical begins like a fairy tale, with a voice saying "Once upon a time in a faraway land a young spoiled, selfish and unkind prince who lived in a shining castle, met a beggar, who came to his door and offered him a rose, for shelter from the bitter cold. Repulsed by her appearance, the prince sneered at her. She warned him never to be deceived by appearances as she turned into a beautiful enchantress. Because she saw that the prince had no heart, as punishment she turned the prince into a beast and placed a spell into his castle that only could be broken when he leaned to love another and earn her love in return." As a story, BEAUTY AND THE BEAST, is really a metaphorical tale that teaches us, that physical beauty is not the “real” beauty. LePRINCE, the original writer who fully understood her characters, gave Belle (meaning beautiful in French this unique conbination of internal and external beauty. Aside from being beautiful, Belle is intelligent, loving and kind. Not for a minute she hesitates to take her father’s place as prisoner of the “Beast.” In the story, The “Beast” is ugly to look at, yet unselfish enough to risk his life for Belle” fighting with the wolves to save her, and later letting her go to visit his sick father. “The horrible beast” is beautiful now, kind and gentle, but it takes a woman like Belle, to understand that. And to round up the story, in her version of the book, WOOLVERTON added Gaston (SMITH-KOTLAREK) to the metaphorically tail. Gaston is everything we consider "beautiful". He is good looking, tall and strong, even rich, but if we analyze his character, how he acts, and what he does, we conclude that Gaston, is really and “ugly” man. Because of how he looks, he is conceited and completely self centered. A narcissist who admires only himself. He is really shallow, and not interested at all in knowledge, He is also revengeful and mean. When Belle rejects him,because she sees his “ugliness” he pays money to suborn a medical person to declare Maurice, Belle’s father crazy and send him to a Mental institution for life, to force Belle to marry him. 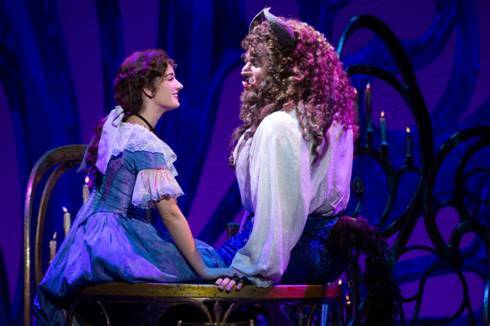 Belle sees his ugliness, and she sees the “beauty in the ugly beast. The internal beauty that Gaston lacks. The Beast can love, Gaston can not. Under the direction of ROB ROTH, this version of the musical has more humorous occurrences thanthe previous versions: The three women who “adore” Gaston (SMITH-KOTLAREK) display a more funny behavior, Gaston hits poor LeFou (DASILVA) too many times for no reason at all, and in his characterization, he exaggerates his narcism to a sickening point. While some of these “comic” occurrences work, and get laughs, others do not. They only manage to brake the thread of the story. 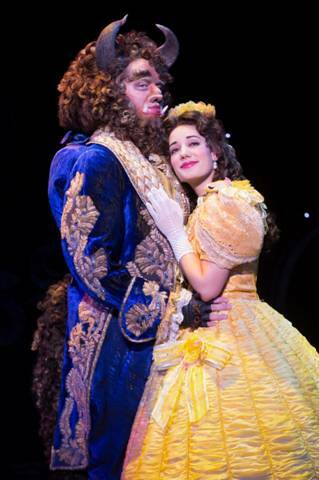 And with QUINTANA, who looks beautiful, sings in a rich timbre of voice and really embodies the character of Belle she represents, and a Beast, (HARTLEY), who manages to convey to the audience his humanity in spite of his appearance, and moves us to tears as he sings “If I can’t Love her” in his Baritone voice, we get caught in the story.